A mysterious object swinging around the supermassive black hole in the center our galaxy has surprised astronomers by actually surviving what many thought would be a devastating encounter. And with its survival, researchers have finally been able to solve the conundrum of what the object – known as G2 — actually is. Since G2 was discovered in 2011, there was a debate whether it was a huge cloud of hydrogen gas or a star surrounded by gas. Turns out, it was neither … or actually, all of the above, and more. Astronomers now say that G2 is most likely a pair of binary stars that had been orbiting the black hole in tandem and merged together into an extremely large star, cloaked in gas and dust. This was one of the “most watched” recent events in astronomy, since it was the first time astronomers have been able to view an encounter with a black hole like this in “real time.” The thought was that watching G2’s demise would not only reveal what this object was, but also provide more information on how matter behaves near black holes and how supermassive black holes “eat” and evolve. 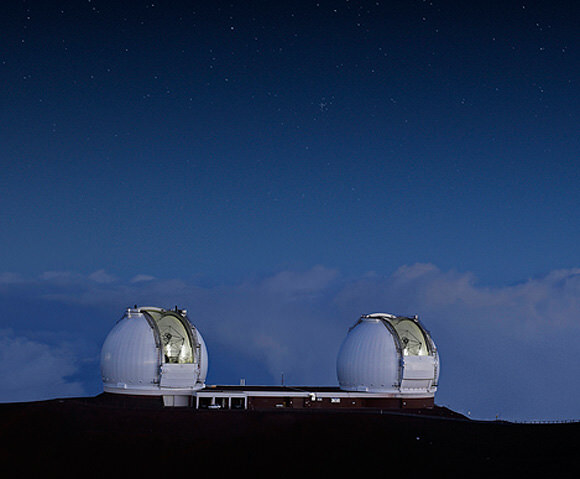 Using the Keck Observatory, Ghez and her team have been able to keep an eye on G2’s movements and how the black hole’s powerful gravitational field affected it. While some researchers initially thought G2 was a gas cloud, others argued that they weren’t seeing the amount of stretching or “spaghettification” that would be expected if this was just a cloud of gas. Now, after watching the object the past few months, Ghez said G2 appears to be just one of an emerging class of stars near the black hole that are created because the black hole’s powerful gravity drives binary stars to merge into one. She also noted that, in our galaxy, massive stars primarily come in pairs. She says the star suffered an abrasion to its outer layer but otherwise will be fine. Ghez explained in a UCLA press release that when two stars near the black hole merge into one, the star expands for more than 1 million years before it settles back down. Ghez and her colleagues also determined that G2 appears to be in that inflated stage now and is still undergoing some spaghettification, where it is being elongated. At the same time, the gas at G2’s surface is being heated by stars around it, creating an enormous cloud of gas and dust that has shrouded most of the massive star. Usually in astrophysics, timescales of events taking place are very long — not over the course of several months. But it’s important to note that G2 actually made this journey around the galactic center around 25,000 years ago. Because of the amount of time it takes light to travel, we can only now observe this event which happened long ago. The research has been published in the journal Astrophysical Journal Letters. We’ve been reporting on this object since its discovery was announced in 2012. G2 was first spotted in 2011 and was quickly deemed to be heading towards our galaxy’s supermassive black hole, called Sgr A*. G2 is not falling directly into the black hole, but it will pass Sgr A* at about 100 times the distance between Earth and the Sun. But that was close enough that astronomers predicted that G2 was likely doomed for destruction. But it appears to still be hanging in there, at least in mid-March 2014. Earlier this week, we explained how there were two ideas of what G2 is: one is a simple gas cloud, and the second opinion is that it is a star surrounded by gas. Some astronomers argue that they aren’t seeing the amount of stretching or “spaghettification” that would be expected if this was just a cloud of gas. The latest word seems to confirm that G2 is more than just a cloud of gas. This is exciting for astronomers, since they usually don’t get to see events like this take place “in real time.” In astrophysics, timescales of events taking place are usually very long — not over the course of several months. But it’s important to note that G2 actually met its demise around 25,000 years ago. Because of the amount of time it takes light to travel, we can only now observe this event which happened long ago. We’ll keep you posted on any future news and observations.